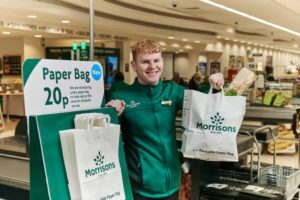 Morrisons is to offer paper carrier bags to all customers, as part of a continuing drive to remove unnecessary plastic from its stores. The supermarket chain’s stores in Wales offered paper carrier bags last week and they will be rolled out to branches in England and Scotland in May. The retailer said the bags have been trialled in eight stores since January and have proved popular with customers. They are made in Wales from paper from sustainably managed forests and are strong enough to carry weights up to 16kg. Priced at 20p (which is the same price as Morrisons’ standard plastic carrier bag), they can be reused and recycled and are labelled ‘Reusable Paper Bag’. Morrisons has also assessed the bag’s carbon footprint and claims it is equivalent to the standard plastic carrier bag.